If you work at a nonprofit organization, you know it can be tough to engage your supporter base. Even though the work you’re doing to save the world is critically important, it’s hard to compete for people’s attention. This is particularly true for engaging supporters online, when you’re up against Tumblr blogs of adorable animals, playing Candy Crush Saga, and watching the latest TV episodes on Hulu. 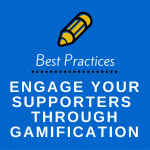 Fortunately, there are ways out there to increase supporter engagement — and a particularly powerful one is gamification. Gamification is the process of taking tactics often used in games and applying them to serious activities. Games do a great job of engaging people — the idea of gamification is to capture that appeal and use it to make non-game activities more interesting and fun for users. You’ve probably used gamified systems before, even if you haven’t realized it. Fitbit and Fitocracy employ gamification to encourage people to exercise more; Treehouse gamifies the process of learning new skills; and frequent flyer programs with airlines often add game elements to accumulating and using flight miles. If you can think about some time when you’ve received points for doing a non-game activity or have competed against friends on some serious task, you’ve experienced gamification. One common point of confusion around gamification is to think that it means creating a game with a focus on a serious topic. While this can be a powerful way to spread a message (check out Spent and Tax Evaders as two great examples), meaningful games are different than using gamification to increase the appeal of non-game tasks. Points: Rewarding points is one of the easiest and most common elements of gamification. 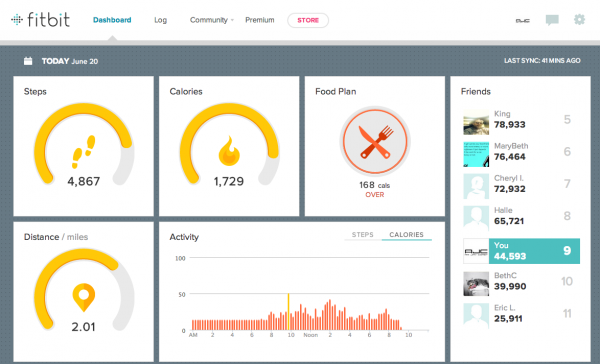 They attach a clear value to taking specific actions and make it simple for users to track their progress. By awarding points for completing them, otherwise menial tasks can be turned into compelling activities. A good example of points in gamification is how Treehouse awards users with points for taking quizzes and completing courses on their site. Badges: Badges are a visual reward for completing a certain task or set of tasks and are designed to give users a sense of accomplishment. 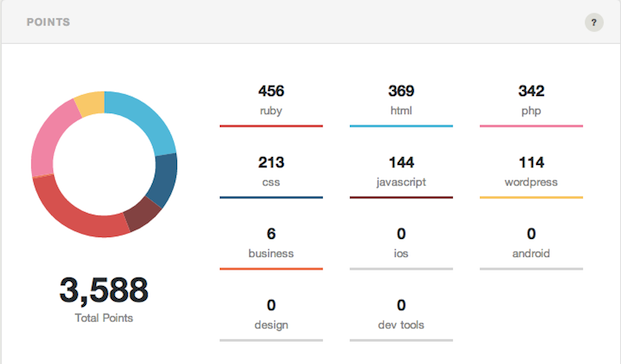 While points provide a more gradual measure of progress, badges give the sense of suddenly taking a big step forward. 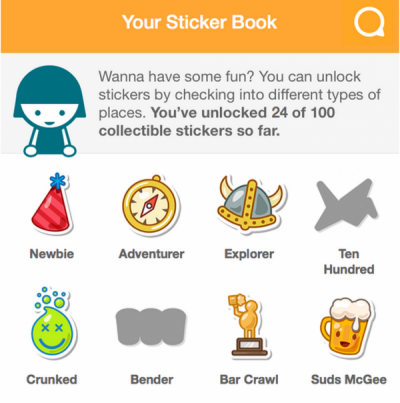 Swarm (formerly Foursquare) makes extensive use of badges called “stickers” to reward users for “checking in” at certain locations. Leaderboards: Competition can be a major motivator in games, and the same holds true for gamification — being able to compare yourself to other players through leaderboards can drive users to spend more time and effort on the desired activities. Leaderboards pair particularly well with points, since they provide a clear quantitative indicator of success. A good example is how Fitbit shows your how you rank against your friends in total steps taken over the previous week. Points, badges, and leaderboards (often abbreviated PBL) are the most commonly discussed gamification elements, but there are many others as well. Leveraging social connections can make activities more fun, and can enhance the effect of other game elements like badges. Challenging users to “quests,” where they must complete a certain collection of tasks, can be a big motivator for people. And mixing in surprises, where certain badges or virtual rewards are given unexpectedly, can keep things from getting boring and engage the reward centers of users’ brains. Commit to Vote Challenge (Democratic National Committee): In 2010, I was working as the director of the web development team at the Democratic National Committee, and our department was tasked with turning more people out in the midterm elections. After some brainstorming, we decided to do this using a gamified Facebook application to encourage people to vote that November. We asked supporters to commit to vote, and then encouraged them to recruit their friends to commit as well. Users could track how many people they’d convinced to commit (points), receive virtual trophies for recruiting more people (badges), and see how their total recruitment count compared to their friends (a leaderboard). The results were impressive; over 600,000 people committed to vote in the election, with more than 500,000 of them having been recruited by friends. 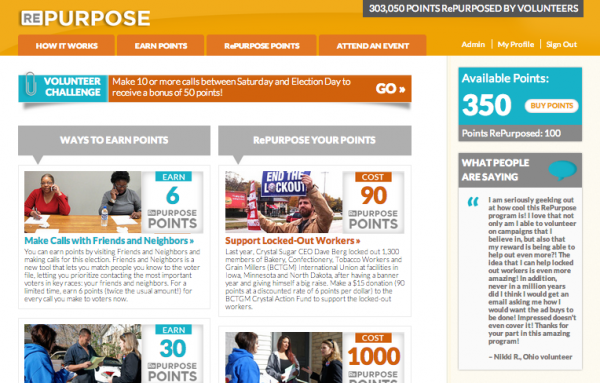 RePurpose (AFL-CIO): In 2012, the AFL-CIO rolled out a new system to increase volunteer engagement called RePurpose. The premise was that people who spent more time volunteering for the organization would have a greater say in how the organization’s money was spent. The means of managing this was via volunteer points, which could be “repurposed” to fund specific efforts. 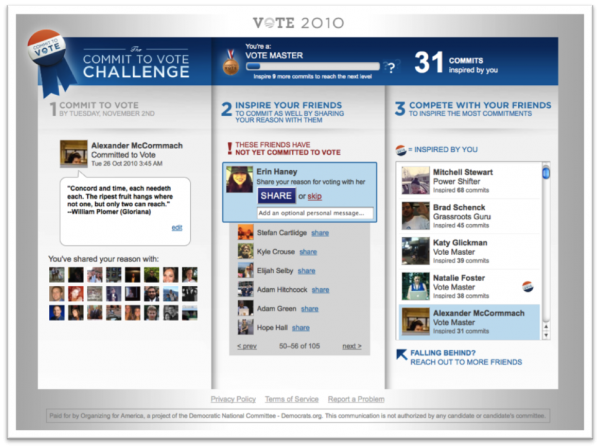 The AFL-CIO introduced additional gamification elements to the tool leading up to the 2012 elections, including volunteer challenges and surprise point awards for using the tool multiple days in a row, and ultimately engaged more than 10,000 volunteers through the site. 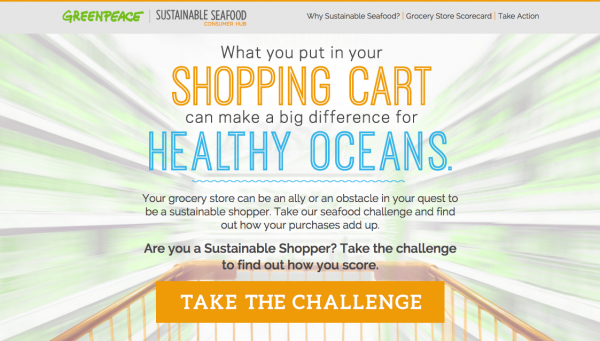 Sustainable Seafood Challenge (Greenpeace): Every year, Greenpeace USA produces a report on how different supermarkets compare in making sure that the seafood they sell is sustainably sourced. The goal of the report is to encourage consumers to adjust their shopping habits to favor more sustainable seafood, but Greenpeace had been having trouble reaching a wide audience with it. To increase visibility, Greenpeace teamed up with ShareProgress to create a gamified Sustainable Seafood Challenge. The website asked users a few questions about their shopping habits, gave them a “Sustainable Shopper” score, and then encouraged them to ask friends to also take the challenge and see if they could do better. How sustainable are *your* shopping habits? Alright, you work for a nonprofit, and you’re interested in using gamification to engage more supporters. How do you make that happen? While there are certainly common tactics, gamification isn’t one size fits all approach — you need to think about your specific audience, what will motivate them, and how that connects to the actions you want them to do. Will they be motivated by tracking points? Are there certain “quests” you can send them on? Can you leverage their social network to make their activities more interesting? Just as designing a compelling game requires a lot of careful planning and effort, designing a compelling gamified system is a difficult task. But if you can get it right, it could mean that your supporters decide to stop looking at those cute kitten photos and spend their time engaging with your organization instead. Thank to Kevin Werbach, whose Coursera course and book For The Win provided a lot of guidance on the principles of gamification. If you work at a nonprofit and would like some assistance with a gamification project, the ShareProgress team is eager to help out — drop us a line!